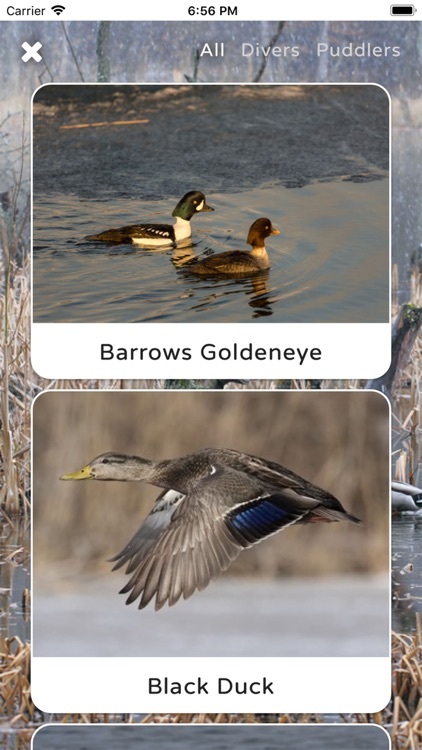 Whether you're just getting into the world of duck hunting, a seasoned duck hunting expert, or just someone curious about the different species of North American ducks, the Duck ID app is for you! There are many places to find information about the different North American duck species, but only one that is designed with the sole intention of teaching you proper duck identification. 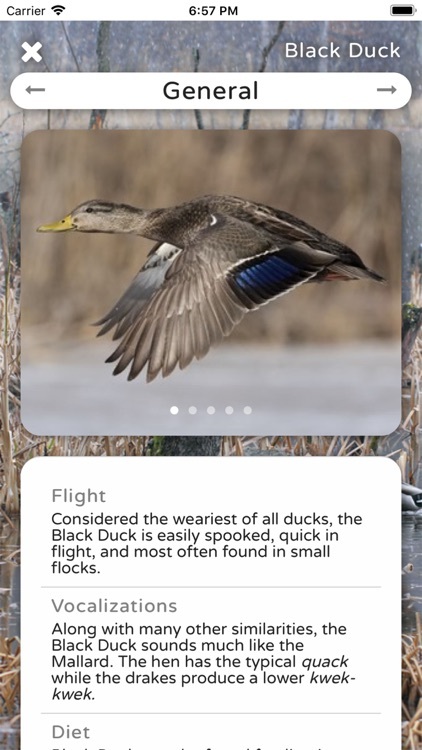 Designed by a duck hunting enthusiast, the Duck ID App gives you real world information on each species along with providing hundreds of flash cards and quiz questions. By the time you've worked through each of these elements, you'll be an expert in duck ID! 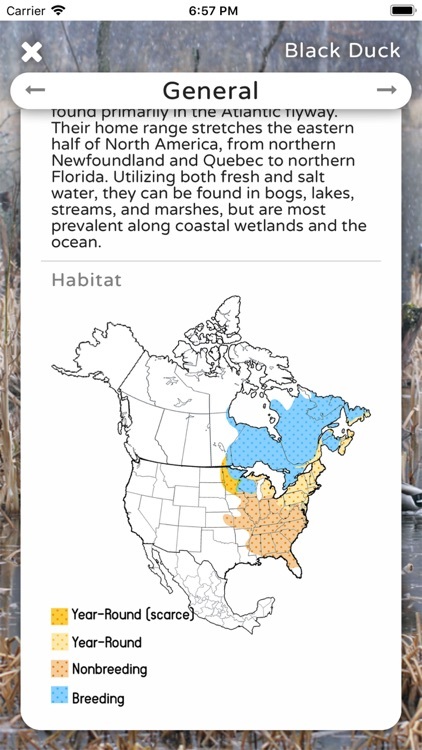 The app starts with Learn Your Ducks, a section with basic information on each of the 31 North American duck species. The General Information section consists of where the species is commonly found, their characteristics in flight, the noises they make, and what their diet consists of. 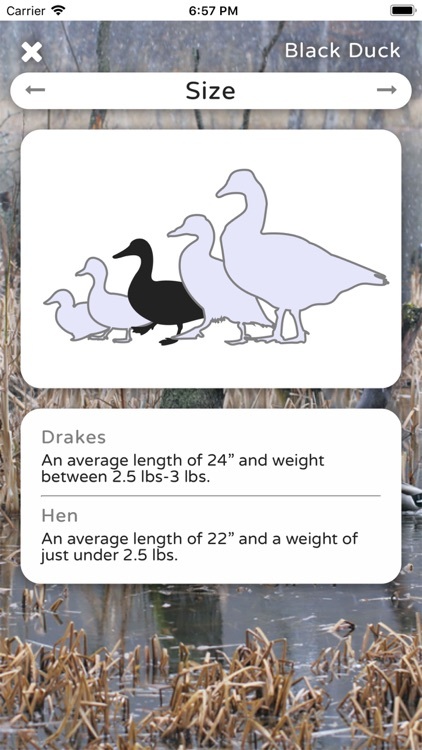 After that, you'll find sections with detailed descriptions and pictures of the size, body, wing, head, feet, and bill for both the hen and drake of each duck species. Lastly, On The Fly will help you know what to look for in each species in in-field settings. Things like; What can you look for in flight or low light situations? What other species is this duck commonly confused with? 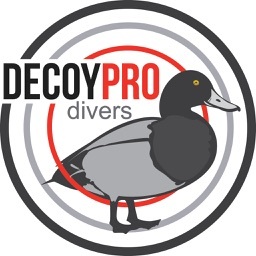 What can you look for to help properly identify a certain duck species? 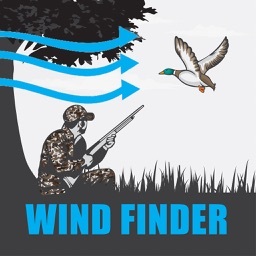 Real world application to help you become more adept in duck identification. After the information section, we have flashcards. No reinventing the wheel here, just using a tried and true method to learn duck ID. When you open this section, you'll see a photo of a duck. Study it and look for it's distinguishing features and then tap the photo. It will flip the card over and reveal the species. 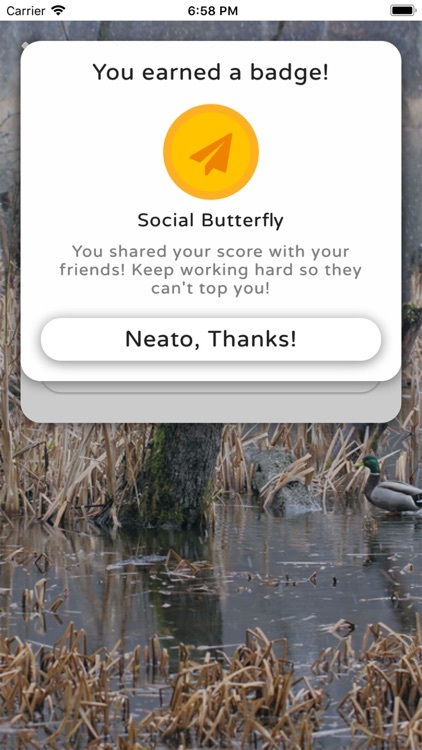 Then click "next" and it'll bring up a new image with a new species. With over 130 flash cards, and more to be added, these are extremely helpful in training your eyes for proper, and quick, duck ID. Lastly, you'll find the quizzes. The Test Yourself section is here to help ensure that you're field ready, internalizing and remembering what you've picked up from the Learn Your Ducks section and the Flash Cards. The quizzes are divided into three groups; Puddlers, Divers, and Mixed Bag. 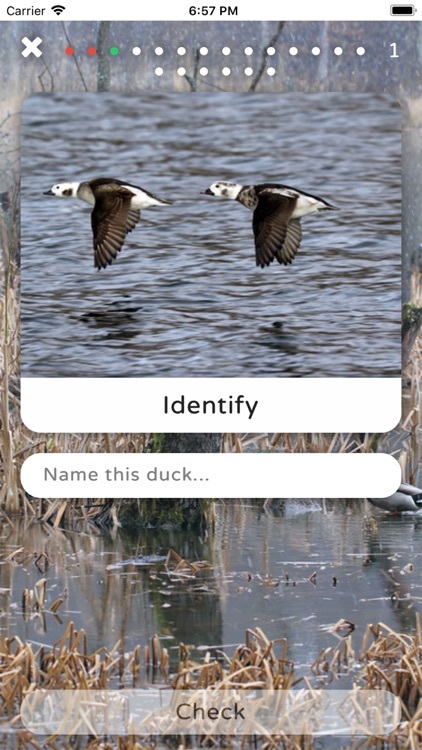 Within each of those groups, you'll find multiple choice questions, "choose all that apply" questions, and fill in the blank identification questions - we show you a photo, you type in what kind of duck it is. 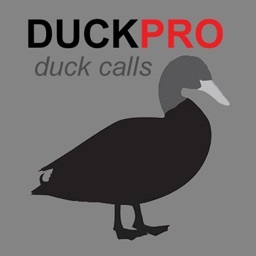 Are you a duck hunting veteran, already an expert in Duck ID? Or do you feel like you've become one? Well, we've got just the thing for you! The Challenge Yourself quiz. One quiz to rule them all. A mix of all the other quizzes combined. Every right answer brings up a new question! But, if you get one wrong...you're done! Set a high score, beat it, and then beat that one too. Take a quiz, improve your Duck ID skills, and share your score with your duck hunting buddies on Facebook! Competition breeds improvement, so challenge them to beat you. 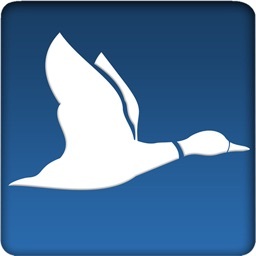 Each section of the Duck ID App is designed to move you closer to becoming an expert in duck identification. The Learn Your Ducks section lays a foundation of information, the Flash Cards allow you to quickly and easily put the information to use, and the Test Yourself quizzes require you to pull from memory what you've learned. 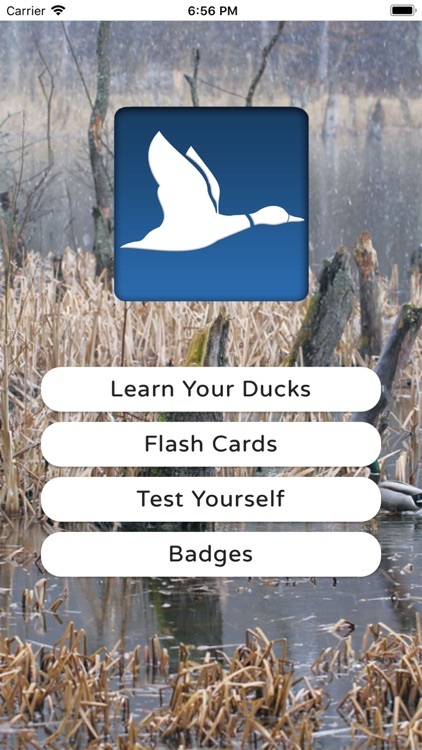 If you spend the time studying this app, using each section, and completing each quiz, your duck identification will be field ready! 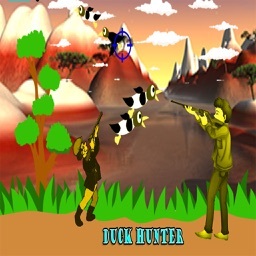 Have you ever been duck hunting and held off of a shot because you weren't confident in what it was? Good for you, you made the ethical decision. Have you ever taken a duck only to find out it wasn't what you thought it was? Accidents happen, but it's up to us to minimize them. Use the Duck ID App so the next time you head out to your favorite spot, you're confident in what you're looking at.